Honestly, I had never heard of John Green before, and I decided to give this book a go! I actually couldn't put it down! It is a fantastic, tragic and epic love story! John Green really empathises with readers in this book. But suddenly, she meets Augustus Waters, and instantly hits it off with him. Her likes her, but she is afraid of getting close to him because of her terminal cancer. They go out together, and they start to get close. She is always talks to him, and they both discover how compatible and how alike they both are. Hazel gets Augustus to read her favourite book, 'An Imperial Affliction.' They decide to go to Amsterdam to meet the author and ask many questions about the book they both wanted to know the answers to. But what happens when repeatedly; cancer limits them both? How does it feel to be so close to losing the one you love, but you haven't even had the chance to know them yet? This book has got a few twists and turns: with bursts of humour and tragedy. ‘The Fault in Our Stars’ is a very powerful book. You can really relate to the characters- the book grabs your attention from the minute you pick it up. 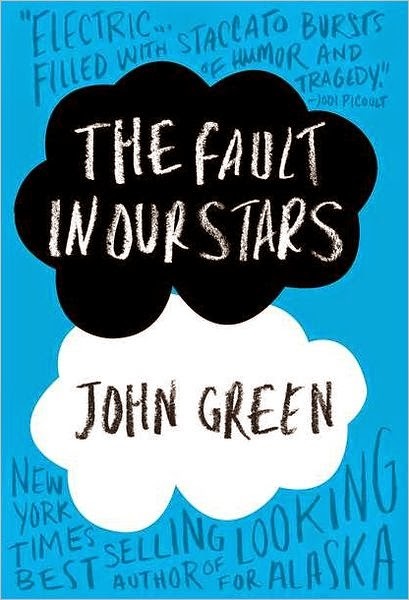 ‘The Fault in Our Stars,’ is one of those books that you can’t put down! You should pick up a copy, and read! I literally can’t recommend it enough! I need a sequel! Once you have read it you will know what I mean!